Who has one producing and how do you like the fruit? I’m grafting one this year which I can get pears from in a couple of years and trying to determine if I want to multi-graft the tree or not. Wow, I’ve never heard of this cultivar. Will be interested to hear about it. What a pretty name.
. I’m grafting both. They look like very different bronzee pears which ars grin lists seperate but does not discuss differences. I’ve got several large duchesse d’angouleme pear trees that are not bronzee as your aware. 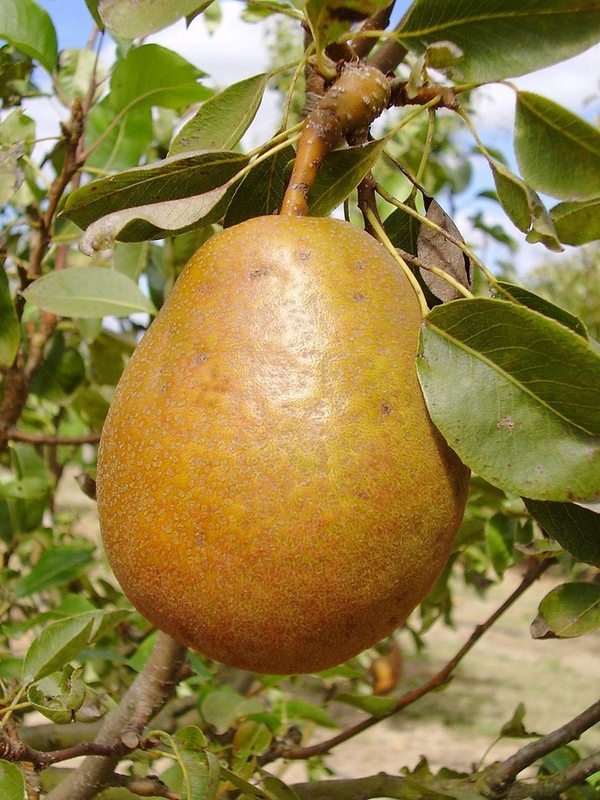 I may grow them on the same rootstock to do an exact comparison using Douglas as an interstem on callery since duchess is believed to be one of Douglas pears parents. 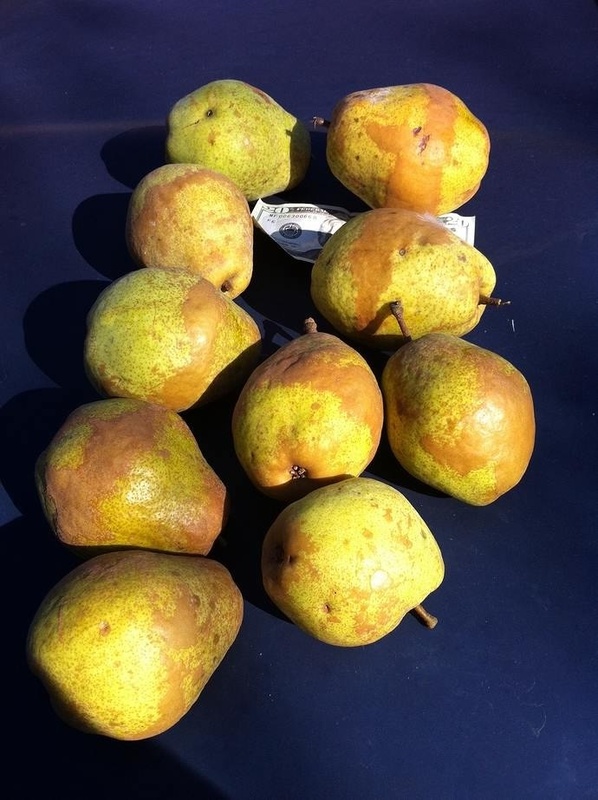 For those not familiar with the non bronzee version of Duchesse d’angouleme more pictures can be seen here Largest / Best tasting pear and here Here comes the 2016 apple and Pear harvest! of the ones I grow. These are a couple of pictures I took last year. Wow some trees produce 20 dollar bills. I’ll take a stick of scionwood from that tree please. I have Duchesse d’Angouleme Bronzee, not sure if it has fruited yet. I’ll check when it warms up. I had some trees that produced of the twenty dollar bills. My neighbors kept stealing them when they were not ripe at the ten dollar ripening stage. I ended up pulling them all out. Maybe I should send you guys a couple of sticks of Andrew Jackson’s. Scions are limited unlike the washingtons which seem to be easier to grow and ripen. Corvallis says that it’s blight resistant! They seem to be extremely fireblight resistant. What root stock did you use for this and did it work well for it? They were gorgeous and broke off in a wind storm so I will need to try again. Lost a lot of grafts this year to that storm but most I had backups. Ouch. I am thinking of using a OHxF root stock since I can only get two scion of this and I am not sure how reliable other root stock choices are. They actually look like the pears on the pear tree I had in my yard years ago. I never could get anyone to tell me what pear tree it was. The people I bought the house from were never available to tell me what it was either. They moved out of state before I bought the house. When do these ripen? Are they hard when they are picked and have to be stored before they are actually ripe? They were as big as my hand. Just curious. They are normally picked hard but they certainly are edible on the tree and can turn to a fairly sugary pear on the tree. They start to get damage in my area quickly so I do not wait as long as I would like to. The pears are very late ripening in the fall eg. September, October, November with the later being better. Here they often rot in the center when allowed to ripen on the tree with a displeasing graininess and they seem to ripen over a fairly long period, making them extra tricky to harvest as a very sweet pear. When timing is right, they are as good a pear as I’ve harvested in NY but not an especially reliable producer. They are not only FB resistant, but also less susceptible to psyla and fabracea leaf spot than Bosc or Seckel. These, along with stink bugs are the worst pests to pears in the NE. 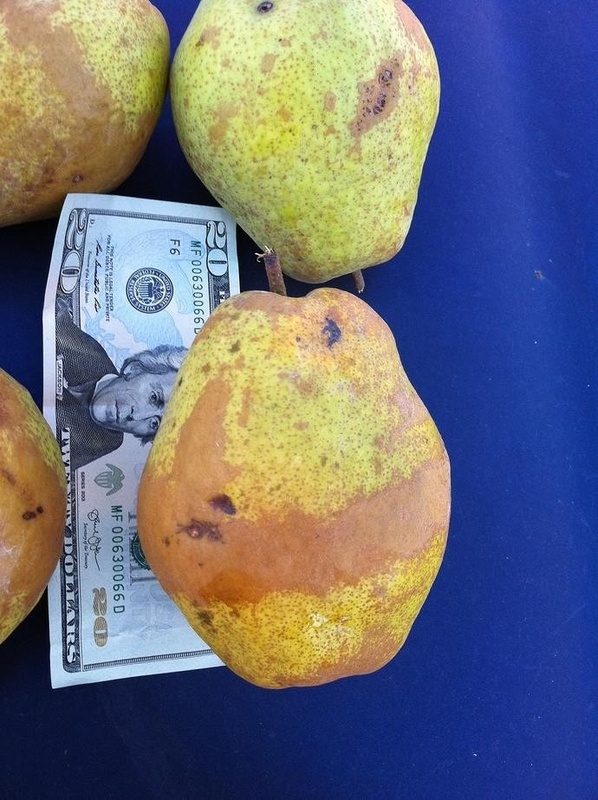 After all these years, I still find timing the harvest of pears one of the greatest challenges of all tasks in managing orchards. My method now is to try to pick about half at peak ripeness and the rest a bit green. The riper pears are best but don’t store well. I still have the greener ones in storage, but they are no better than store bought.